Caution, Debunked: The actual screen shot is fake, whether the information is too, remains to be seen. The article remains below in its unaltered state. Some new information about Windows 9 has surfaced over at Chiploco.com. This gives a much anticipated glimpse into what the developer version and probably the final version of Windows 9 is going to look like. It would appear that Microsoft is doing its level best to appease the adamant Windows 7 fans by ditching most of its Metro UI start screen system. 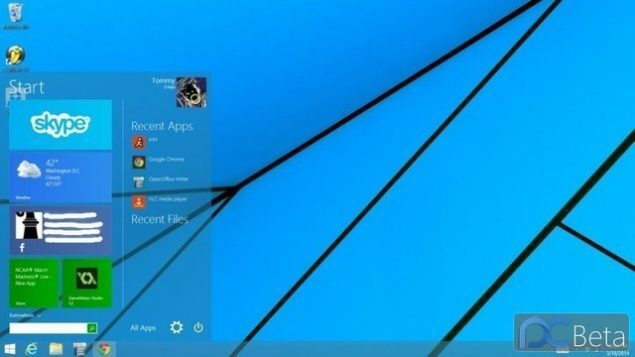 Although snippets and glimpses of the new windows have leaked out before, this leak gives a look at the complete aesthetic of the upcoming Windows 9. Now the build is called 6.4.9788 which means that seeing the current trend we are looking at a release date of around Q4 2014. As we already know, Microsoft has decided to completely ditch the start screen in Desktops, and has reverted to the Windows 7 boot to desktop style. We have the beloved start button back, something, once again, which we already knew. Now we recently learned that Microsoft has incorporated some of the Metro UI into its start menus, and these screenshots show in detail just that. The Metro Apps part will be the left side of the start menu, and for the Windows 7 die hards, it can be turned off thankfully. A more streamlined version of the familiar start menu will be on the right side and it looks like most of the windows 7 aesthetics have been combined with windows 8’s icons to a promising looking effect. I myself still use Windows 7, since I love the Aero look too much to move to the obsolete looking (in my opinion) static look favored by Windows 8/8.1. However, if most of the transparency functionality is included by default then I could get used to this, and since we can turn the Metro APPs off complete, it seems like a good effort from Microsoft’s Part. One of the primary reason Microsoft has adamantly refused to leave behind the Metro UI is because of its iconic role in mobile devices, which has admittedly costed them quite a few dollars. However, this new peace offering along with DX12 support might just be enough to win the support of the Windows 7 Community. Microsoft is ending mainstream support in 2015 anyways so now would be a good time to make the shift. Although to be honest, I would have killed for the following aesthetic.